Despite many attempts to oust it in popularity, it seems the cupcake is here to stay. To celebrate its Fine Cooks’ chocolate range, Dr Oetker have issued a new cupcake challenge – The Great Chocolate Bake. Apart from the fun to be had in creating your own cupcake design, there is quite an incentive to win. The prize is a trip to the home of the cupcake itself, New York. You have until the 17th of October to make some sort of chocolate cupcake and enter it on the Dr Oetker Facebook page by submitting a photograph of your masterpiece. Last week was the annual Macmillan Coffee morning held to raise funds for cancer care. With all this talk of cupcakes and a veritable cornucopia of Dr Oetker chocolate sent to me to use, my contribution was definitely going to be of the cupcake variety. As regular readers will know, taste and texture are my prime concerns, the rest is literally icing on the cake. I’ve long been a fan of chai tea, despite my lack of partiality for the black stuff. I’ve always thought it would make an excellent flavour in cakes, but until now I haven’t tried it. 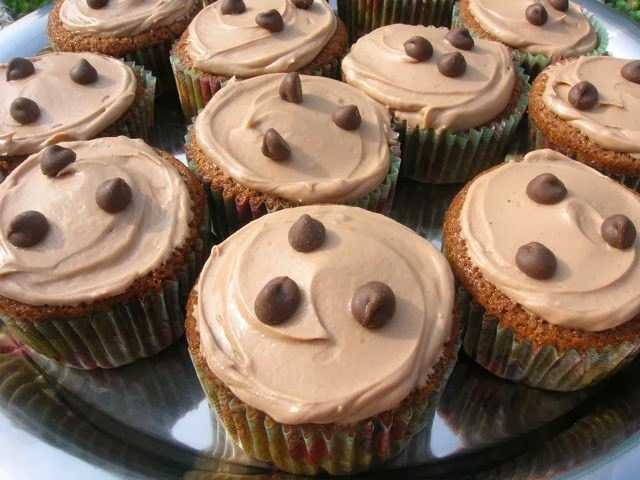 I adapted a recipe for Chai Masala Cupcakes from Indian Inspired Desserts by Roopa Rawal, mostly by adding chocolate. I’ve had my eye on this recipe for ages; it is a particularly interesting one as it is made without eggs. Although I normally bake with dark chocolate, chai is such a sweet drink, I decided that milk chocolate would be the best choice in this instance. Brought 450 ml milk to the boil ( I used the milky whey left over from making paneer) with 2 rounded teaspoons of black tea, ¼ of a crushed cinnamon stick, 1 clove and 3 crushed cardamom pods. Turned the heat off, covered the pan and left to infuse overnight. Melted 80g of Dr Oetker milk chocolate (35%) in a bowl over hot water, then left to cool a little. Creamed 170g unsalted butter with 200g sugar (150g cardamom caster sugar and 50g dark muscovado) until pale in colour and fluffy. Added a pinch of ground cloves, ½ tsp ground ginger and ¼ tsp ground cinnamon and creamed some more. Sifted 190g flour (half wholemeal, half white) into a bowl together with, 3 tbsp cornflour, 1 rounded tsp baking powder, ½ tsp bicarb of soda, ¼ tsp Himalayan rock salt (seemed rather appropriate). Added the flour to the mixture, alternating with 390 ml of the chai until all was incorporated. Stirred in 1 tsp white vinegar. Spooned into twenty bun cases, filling them to about ¾ of the way up. Baked at 180°C for 20 minutes until they were well risen and a cake tester came out clean. Left for a couple of minutes, then turned out onto a wire rack to cool. Melted 70g Dr Oetker milk chocolate (35%) in a bowl over hot water, then left to cool a little. Creamed 150g unsalted butter with 200g icing sugar until creamy. Beat in ½ tsp vanilla extract, a pinch of cloves, 1/8 tsp ginger and 1/8 tsp cinnamon. Beat in about half of the remaining chai. Stirred in the melted chocolate until just incorporated. Spread this on top of the cooled cakes then decorated with Dr Oetker milk chocolate drops. I had to bake these in two batches as I didn’t have enough bun holders and just as well I did. The first batch fooled me and I thought they were done when in fact they weren’t. This resulted in a deliciously light yet fudgy consistency, but had the downside of sinking in the middle and pulling away from the bun cases which I wasn’t best pleased about. The second batch I baked for a little longer and luckily they looked a lot better. I managed to get about 12 reasonable looking ones out of the whole batch, which were the ones I took over to Jelly Pebbles for the Macmillan Coffee Morning. Luckily, the cakes turned out to have a definite, but not overpowering taste of sweetly spiced chai tea. The texture was moist but very light with a slightly fudgy consistency which was quite appealing. I was gratified to get some positive feedback from the two people who tried them before I left to go home and get my next next batch of cakes started. I think these are destined to become one of my favourite fairy cake recipes, an all round winner. Dr Oetker have a number of chocolate products that are ideal for making and decorating cupcakes. These include a dark 72% as well as a 54%, a milk 35% and white chocolate in 150g bars. They also offer chocolate chips and chunks in dark, milk and white. To give you some inspiration and showcase a few techniques to give extra pizzazz to your cupcakes, Lisa Marley has created some recipes especially for this challenge. You can see her video tutorials here. The letter selected for AlphaBakes this month is C. This means I could theoretically enter every bake I post this month using C for Chocolate. However, I am going for something a little bit different and am entering these as C for Chai. This is a monthly challenge hosted alternately by The More Than Occasional Baker and Caroline Makes. As this is a recipe I’ve had my eye on ever since I got the book last year, I am submitting this to Bookmarked Recipes over at Tinned Tomatoes. Thank you Jill. I think you are right, I’d be very interested in trying this flavour in macaron form. Are you going to make some? I love the combo you’ve created here I bet they taste incredible and they look very sweet too… surely they’re winners? Dom they are, they are – the sort of cakes, it’s actually hard to stop eating. Luckily I gave most of them away. They look really good – have you tried a dark chocolate version yet? Would be interested to know if it works as well as the milk. The same day I made some chilli chocolate fairy cakes using dark chocolate, but it was a different recipe using eggs and obviously not flavoured with chai. I’m sure they would work fine with dark chocolate, but somehow I think milk is the better option. I have had chai cupcakes before and was surprised how well they worked – I say surprised because the chai mix always uses cardamom which, on it’s own, I don’t like. Your cupcakes are very cute! I want to lick my laptop screen — and I LOVE your header photo! These look fantastic! I love that you infused your own chai tea blend. I’ve only ever used powdered chai in baking but making your own must taste even better. They must be delicious!! I love chai tea, in fact I am addicted to it! I am bookmarking this. Thank you. Ohh this is the most delicious-looking blog ever, love chocolate!!! They look great! I am glad I don’t live near you though. I would be like two ton tessie! Thanks for submitting them to Bookmarked Recipes. The roundup is now live. Chai and chocolate, what a happy combination! love this combo, thanks for the creativeness! I’ve never put spices in icing but I’m sure it tastes good. You’ve been so precise, with just three chocolate drops. The cakes look lovely. These look delicious, will have to try this one!